Here we are going to have a look at the types of toilets that are readily available in the Irish market place. In today’s era we more or less take our humble bathroom toilet for granted. Roll back 10 years and you would find that most houses weren’t even connected to the public sewerage system. Nowadays your toilet is not only practical but can represent your personal style and individuality. These days there is a massive range of toilets out there. They are available in different sizes, colors and types. 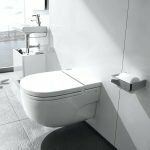 We will try to cut through the professional plumbing jargon and give you a description of the different types of toilets and their individual advantages. Types of toilets and their advantages. These are generally the most common type of toilet in Ireland today. A closed-coupled toilet consists of 2 parts, the cistern and the pan as a rule both parts are ceramic. The cistern is fitted directly above the pan and can be flushed by either a lever handle or more commonly on newer toilets, a dual flush button to encourage water conservation. They can be purchased in a huge range of shapes, colors and styles. When choosing you can be as adventurous as you like. 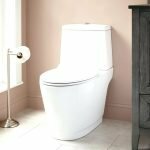 These types of toilets are usually the cheapest to buy and to have installed. A large range of styles. colors and shapes available. The soil pipe can usually go out down the back or to the left or right. These types of toilets are modern looking and give a minimalist look. On a back to wall toilet the cistern is concealed behind a piece of furniture or in the wall. This gives a neat finish and helps to maximize space in your bathroom. or cloakroom. Some concealed cisterns are shallow in depth, this can actually be less than a close-coupled toilet. If you need to carry out repairs on installation there are 2 ways to accommodate this. If is fitted behind or within bathroom furniture an access panel can be built in. If it is fitted within a wall then a flush plate should be installed. If either of these methods is completed on installation, maintenance shouldn’t be more difficult than with a standard toilet. What we have noticed though that during the boom a lot of apartments were built with back to wall toilets. The problem here is that the builders didn’t build in access panels. This is fine until something goes wrong. After 10-15 years washers and siphons start to wear. When something does go wrong this can become a much larger job. 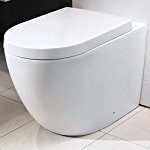 Gives a modern and stylish look and can be a lot cheaper than the cost of buying and fitting a wall-hung toilet. Installation being easier as you do not require a support frame. Makes the bathroom look larger and less cluttered. Excellent for use if you have a run of furniture in the bathroom. Wall hung toilets or wall mounted toilets. These types of toilets again have the cistern hidden away. Usually behind a wall but also a furniture unit can do the job. They are fitted with a chrome flush plate so as to access the cistern if required. A strong wall frame built, this then houses the concealed cistern and in turn provides support for the toilet. A wall hung toilet, can as a rule be fitted to any wall as long as it is supported and reinforced correctly. The floor is totally free creating the impression of extra space as well as providing it. Can add the X-factor to your bathroom due to it’s elegant style. Will support 200 kg of weight when fitted correctly. 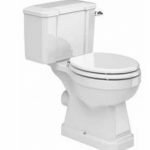 These types of toilets also known as fully-enclosed toilets are a variety of close-coupled toilet. The difference to the standard closed-coupled toilet is that the cistern goes right back to the wall. This creates a smooth and tidy finish. Please note that this sort of toilet can only be fitted if the waste pipe is directly to the back of the toilet (not to the left or right). Because of the neat design no unsightly pipework can be seen. These types of toilets are normally between 4-6 cm taller than any standard toilet. They can be very beneficial for elderly, infirm or taller people. Tough the height difference may not seem much it makes standing up after sitting on the toilet much easier. If you require a bathroom designed for specific needs this can make a big difference. The extra height may not seem like a big difference, but for those that are slightly taller, elderly or infirm, it makes getting up and down from the toilet much easier, and a bathroom designed to accommodate your needs can make a huge difference. The higher seating position provides a more comfortable experience for those less able. They provide relief of pressure on the lower body joints especially the knees. All of these types of toilets are readily available in the Irish market place. If you would like more information or a free quote just call one of our experts on 01-6874853. Get your 10% off you new toilet installation today!